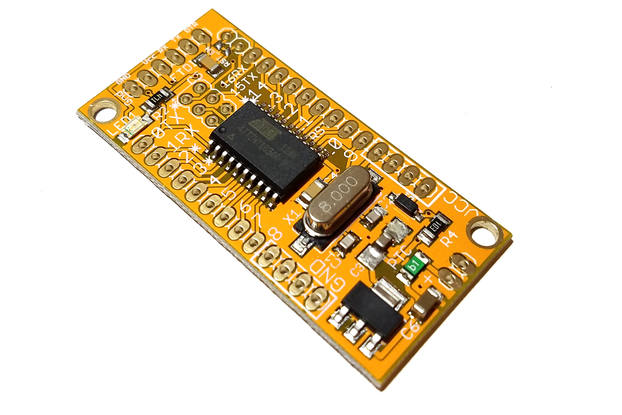 I build projects with Arduino (ATtinies almost exclusively, never anything bigger than a '328p) and Espruino (often both working together), and I make a lot of circuit boards for these projects. 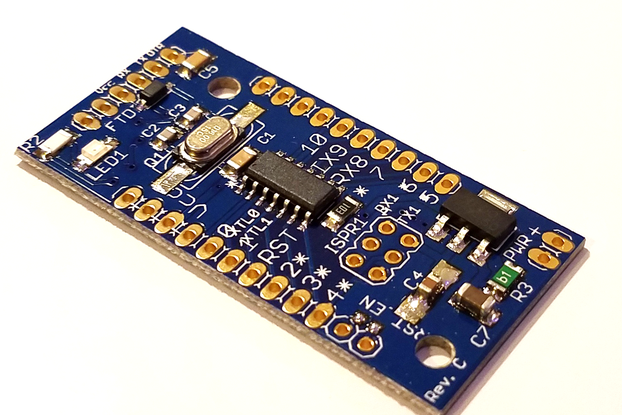 Particularly after using my ATtiny-prototyping board for my own projects, I realized that these would be useful to other people, and decided to start selling them here on Tindie. Strip Board, Protoboard, prototyping board, solderable breadboard - whatever you want to call it - it has been a mainstay in electronics prototyping for decades, and hasn't changed much in the interim (not even in production quality, as they're still often single-sided and/or manufactured from low-grade phenolic resin instead of FR4). 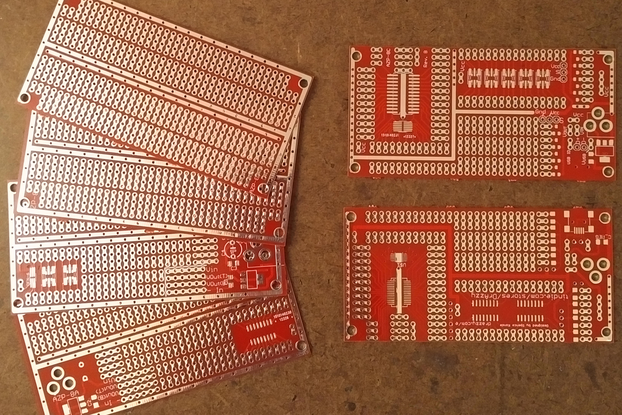 My prototyping board creations bring these into the modern era, offering a combination of 0.1" through-hole prototyping areas (consisting of groups of 2, 3 or 4 pins connected together, like solderable breadboard) and pads for common surface mount packages connected to through-holes for easy soldering. 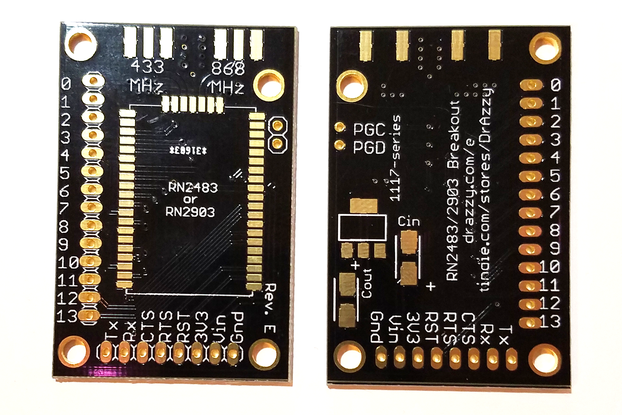 To handle projects of all sizes, I offer prototyping board as large as 4" x 4", down to less than an inch square in my Mini Protoboard line. 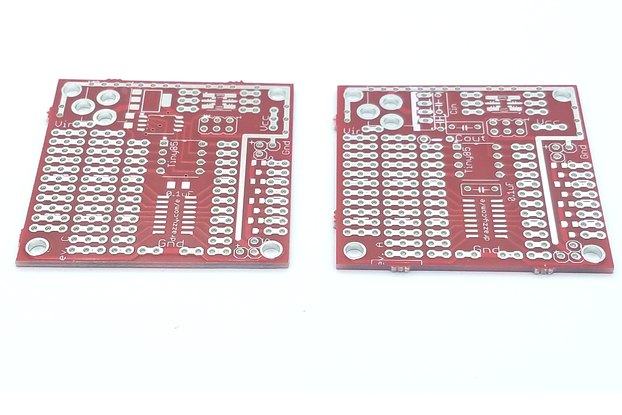 Unlike most commercial prototyping board, these boards are made to the same quality standards as real PCBs. 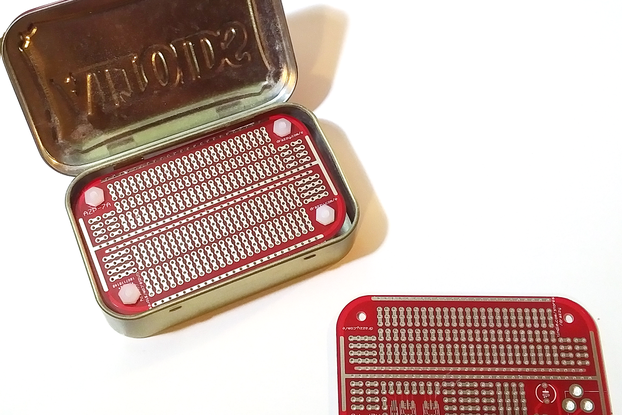 Through-holes are plated, and the boards are double sided. 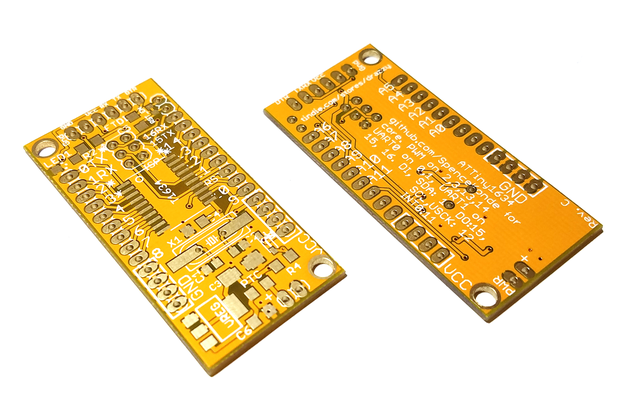 These are offered in both generic versions, and ones tailored to specific microcontrollers, like the Tiny84/85, or microcontroller boards, like the Espruino Pico, Arduino Pro Mini, and the wildly popular ESP8266. 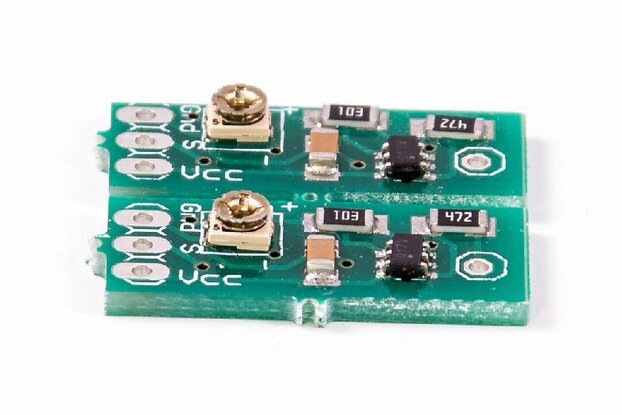 I love the ATtiny lineup, particularly some of the less popular ones, like the incredibly full-featured ATtiny841, ATtiny1634, and ATtiny828. 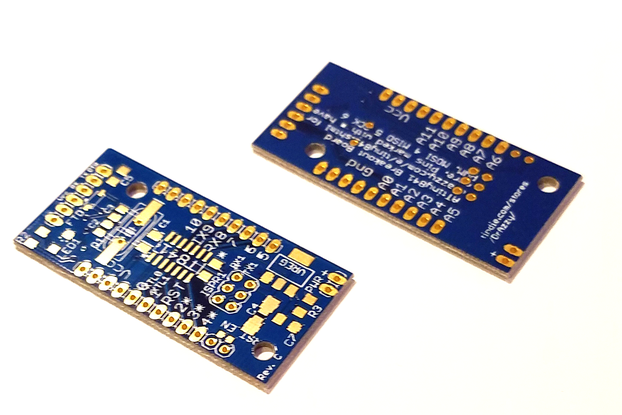 Breakout boards for these that had the features I wanted were not readily available - so I made my own. 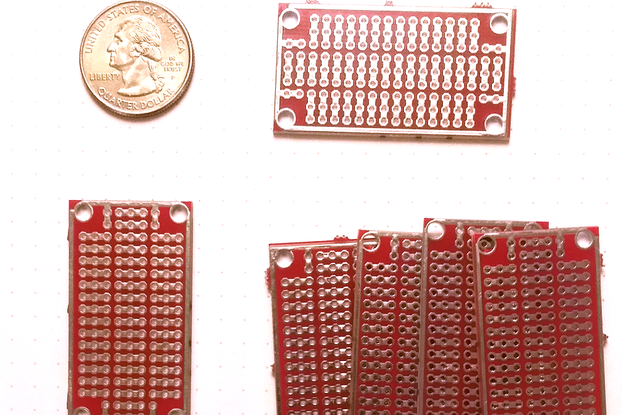 I've since expanded my product line to include breakout boards for the ATtiny861, ATtiny167, and ATtiny88 - and all of these are available both as bare boards and assembled. 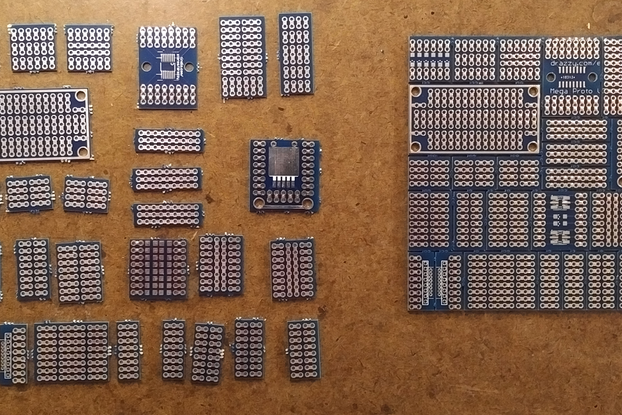 In addition to designing the hardware I also maintain [ATtinyCore Universal](https://github.com/SpenceKonde/ATTinyCore), which enables Arduino support for all these ATtiny's and more. 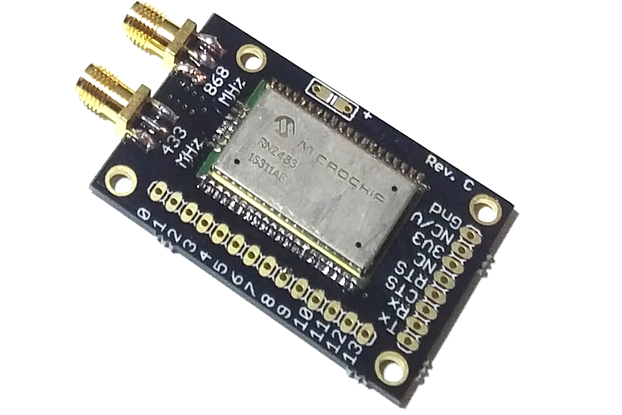 I also sell a number of other boards to fill what I felt were gaps in the market, including a breakout board for the popular LoRa/LoRaWAN modules from Microchip (the RN2483 and 2903), which has become one of my top selling items. I also sell MOSFET drivers and breakout boards for logic level MOSFETs operating at logic levels of 2.5v and lower - while a great number of MOSFETs are available that operate with very low gate voltages, these are almost invariably SMD parts which are difficult to use without a properly designed breakout board. We ship within 1-3 days of receiving an order (usually closer to 1 day). Please be sure that the address given to Tindie is accurate, and includes your street name and number - company name is only required if shipping to a commercial address. International orders require a valid phone number. Domestic packages that go more than 1 week without a tracking update will be presumed lost in the mail and refunded or reshipped as buyer prefers. Any international packages can be delayed in customs without warning for 2 weeks or more. After 1 month without a tracking event, we will reship or refund a missing order (as you prefer). We do not open inquiries through the postal service - experience has shown this to be futile.